Before Goldfinger was an iconic film (with a great song sung by Shirley Bassey), it was a novel by Ian Fleming. 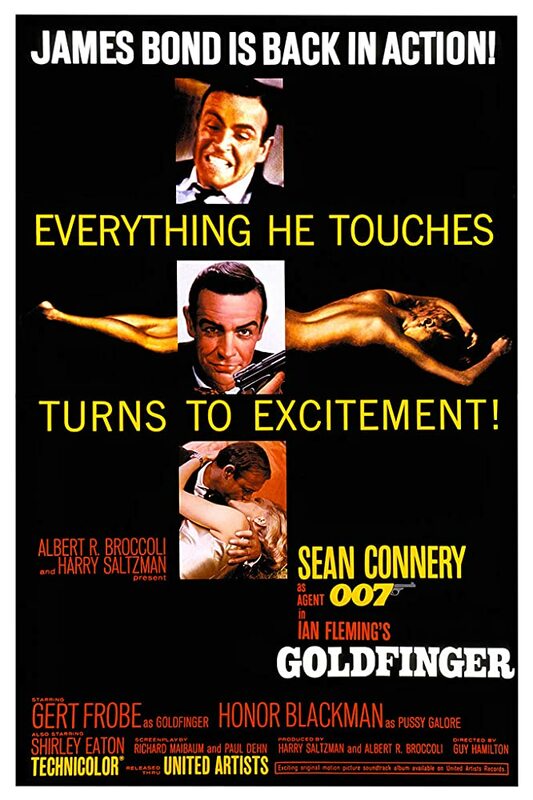 Kick off the 2019 Arkansas Literary Festival with a screening of the 1964 film Goldfinger, the third in the franchise. The screening starts tonight at 7pm at the CALS Ron Robinson Theater. Directed by Guy Hamilton from a screenplay adapted by Richard Maibaum and Paul Dehn, this is considered by many to be the best classic Bond film. Goldfinger is stockpiling gold reserves. Bond investigates and uncovers an audacious plan to commit the heist of the century. Sean Connery returned as the suave spy. Joining him in this outing were Gert Frobe, Honor Blackman, Harold Sakata, Bernard Lee, Martin Benson, and Lois Maxwell. The film won the Oscar for Best Sound Effects, which went to Norman Wanstall. The Central Arkansas Library System is going through a strategic-planning process. As part of that, they are asking people to take a few minutes to fill out a survey. It does not take long. There is no capturing of email or phone number at the end which will end up putting you on a list to be barraged with offers. It helps the Central Arkansas Library System and all of its programs such as the Butler Center for Arkansas Studies, Arkansas Sounds, Arkansas Literary Festival, and the list goes on. Notable authors, including Pulitzer Prize and Grammy Award winners, filmmakers, singers, and artists are among the diverse roster of presenters who will be providing sessions at the Central Arkansas Library System’s (CALS) fifteenth annual Arkansas Literary Festival, continuing through April 29, 2018. The premier gathering of readers and writers in Arkansas, the Festival offers a mix of sessions, panels, special events, performances, workshops, book signings, and opportunities to meet authors. More than 70 authors, essayists, and illustrators—who have achieved national and international acclaim—represent an array of genres and will discuss topics such as science fiction, fantasy, crime, southern life, social commentary, science, women’s history, young adult and children’s books. Presenters come from a variety of backgrounds ranging from professors at New York University and Yale University to former NBA All Stars. The full list of authors is available at www.ArkansasLiteraryFestival.org. Author! Author!, Friday, April 27, at 7:00 p.m.
A cocktail reception with the authors. Tickets are $40 at the door. Special rates are available for students and groups. An Evening with Sebastian Junger, Saturday, April 28, at 7:00 p.m.
Festival sessions for children will take place in Youth Services and Level 4 at the Main Library, 100 Rock Street, and at the Hillary Rodham Clinton Children’s Library and Learning Center, 4800 W. 10th Street. Events at Children’s Library are hosted in partnership with Junior League of Little Rock/Little Readers Rock. In addition to programming at CALS locations, the Festival provides presentations by several authors for Pulaski county elementary, middle and senior high schools, and area colleges through the Writers in the Schools (WITS) initiative. This year’s Festival authors have won an impressive number and variety of distinguished awards and fellowships such as the Pulitzer Prize, Grammy Award, Coretta Scott King Honor, NAACP Image Award, National Magazine Award, SAIS Novartis Prize for Journalism, National Book Critics Circle Award for Nonfiction, TIME’s 100 Most Influential People, Will Eisner Comic Book Hall of Fame, Wizard World Hall of Legends, Eisner Award for editing, National Book Critics Circle John Leonard Prize, CantoMundo Poetry Prize, Dzanc Books ILP International Literature Award, Bard Fiction Prize, Autumn House Fiction Prize, Guggenheim, Cullman Center, FONCA, DAAD, Michener Copernicus Society, Callaloo Creative Writing, The Francis Writer-in-Residence at Yale, artist in residence at the University of Pennsylvania, Breadloaf Writer’s Conference, the MacDowell Colony, Capote, Mississippi Arts Commission, Bronx Council on the Arts, Tennessee Arts Commission, and Iowa Writers Workshop. Support for the Arkansas Literary Festival is provided by sponsors including the Arkansas Humanities Council, National Endowment for the Humanities, Friends of Central Arkansas Libraries, Little Rock Convention & Visitors Bureau, Rebsamen Fund, Department of Arkansas Heritage, ProSmartPrinting.com, KUAR FM 89.1, Arkansas Democrat Gazette, Clinton Presidential Center, UA Little Rock Department of English, Windstream, Wright Lindsey & Jennings LLP, Whole Foods, Museum of Discovery, Capital Hotel, O’Looney’s Wine and Liquor, Oxford American, McMath Woods P.A., Hall High School, Parkview Arts and Science Magnet High School, Mabelvale Elementary School, Terry Elementary School, ESSE Purse Museum, Historic Arkansas Museum, Witt Stephens Jr. Central Arkansas Nature Center, University of Arkansas Clinton School of Public Service, Mick Wiggins, Christ Episcopal Church, Literacy Action of Central Arkansas, Celebrate! Maya Project, Hampton Inn Downtown Little Rock, Residence Inn Downtown Little Rock, Argenta Reading Series, University of Arkansas for Medical Science, Pyramid Books/Hearne Fine Art, Arkansas Times, Southern Glazer’s Wine & Spirits, The Root Café, Humane Society of Pulaski County, Bob Razer, Mollie Savage Memorial, Four Quarter Bar, and partner Junior League of Little Rock/Little Readers Rock. Eliza Borné was named Editor of Oxford American magazine in October 2015. She had been the Managing Editor of the magazine, prior to that appointment. Under her leadership, the magazine has won the 2016 Ellie – National Magazine Award in General Excellence. A Little Rock native and graduate of Central High School, she wrote Children’s Theatre reviews for the Arkansas Times while in high school. While a student at Wellesley College, she interned for OA. After graduation, she was an associate editor at BookPage. In February 2013, she joined the OA as an editor. When he was in Little Rock earlier this year, author Harrison Scott Key praised Borné’s skills as an editor. At that appearance, he also lauded her skills as an interviewer. She has also used these skills serving as a moderator for the Arkansas Literary Festival. While her talents as a writer and editor have been honed through hard work, she is also carrying on a family tradition in promoting Little Rock’s cultural life. A great-grandmother, Adolphine Fletcher Terry, was a member of the Little Rock Public Library Board (a forerunner of CALS) for decades. Much could be written about what various ancestors have done to help Little Rock, but Borné is not one to rely on the family name as she forges her own career. Instead, she uses her skills and love of Little Rock to promote good writing, good music, and good living. Since 2016, Eliza has served on Little Rock’s Arts+Culture Commission. For twelve years, Scott Walters has been an advocate for many things in Little Rock. One of these has been the arts — especially literature, visual arts and music. His tenure as Rector of Christ Church saw the concerts by Mavis Staples and the Arkansas Symphony Orchestra, the development of The Undercroft music venue, the creation of the Sixth Street Library gallery, and partnerships with the Arkansas Literary Festival. As he moves on to his next adventure in Memphis, this is a chance to say farewell to him. to a church of rock in a city built on a rock. He was a student of cultures (both pop and high). He was called to aid people as they worked and watched and wept. During times of joy and woe, he shared insight he had gained. Like the philosophers of old, he raised questions not easily answered. Or a pilgrimage through Spain. And all other personalities included in this story of human redemption. Its neighborhood and its city built on a rock. Their impact spread far beyond the half of a city block. There are many more lessons to teach. There are many more lives to touch. There are new words to explain. There are new worlds to explore. When particles collide, they are forever changed. The particles are eternally impacted because of the contact. Is likewise evermore transformed by the troubadour and his household. And ordinary time that twas always more than that. there is a perfect response when met with a strange new reality.